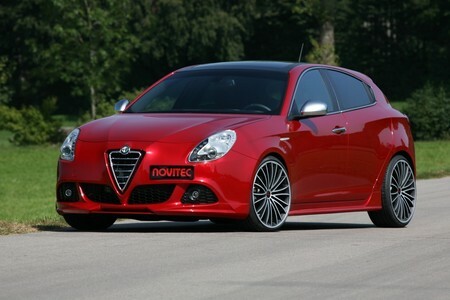 The absolutely beautiful Alfa Romeo Giulietta has been given a refreshing makeover by Italy’s biggest tuner, Novitec Rosso. There is a subtle body kit in the package, including front spoiler, side skirts, a racing rear diffuser and four tailpipes. The look is further enhanced by the lowered suspension and 20-inch multi-spoke wheels. Upon request, they can also fit the car with an adjustable system that can change the ride height for as much as 70mm. As for the engines, Novitec’s thorough treatment results in 141 HP (104 kW) for the 1.4 TB and 195 HP (141 kW) for the Multiair version, as well as 261 HP (192 kW) and 386 Nm of torque for the 1.8 liter turbo and 95 HP (143 kW) and 400 Nm of torque for th 2.0 liter diesel.